in the NCAA title game April 6. Scrolling through my assorted social media feeds late the evening of the NCAA National Championship, I came across a post from one of my Facebook friends. He made an apropos comparison for the 2015 Badgers, a comparison that put the legacy of this unique year in proper perspective: They are our generation’s 1982 Milwaukee Brewers. One could make the case that this does take the No. 1 slot among wince-worthy Wisconsin-based games of the past decade-plus. ... For the Badgers, there they were, almost a half of a half to go with a nine-point lead on Duke – THE Duke Blue Devils. Ah, another heartbreaker. I jested a year ago about Bucky running into another Aaron Harrison three-pointer from somewhere miles away from the stadium during the Final Four, but while a second painful Kentucky loss was not in the cards, another higher-profile painful loss for our state’s sports scene did come to fruition. Maybe the Duke loss tops – or bottoms – the Packers’ Seattle collapse, but it does supersede the Brewers’ 2014 disintegration, if only because of the stakes involved. One could make the case that this does take the No. 1 slot among wince-worthy Wisconsin-based games of the past decade-plus, if only because this was an actual title game. Fourth-and-26, playing the Giants in the playoffs, etc. … all had at least one more game pending, and we will never know the result of a hypothetical next round. For the Badgers, there they were, almost a half of a half to go with a nine-point lead on Duke – THE Duke Blue Devils. The memory of the 48-39 scorebar at the bottom of the screen holds like a DVR on pause. We do know that some different outcomes would have led to the ultimate outcome: an NCAA trophy in Madison, rather than yet another in Durham. A lead late in a final game – this is where the ’82 Brewers connection starts. Remember that the Brew Crew held a 3-1 lead going into the bottom of the 6th inning of Game 7. In the pace of that game, they were about as close to winning it all as the Badgers were against the Blue Devils. Yet this is a forgotten aspect of that early-’80s run. To many, Game 5 was seemingly like winning the World Series, the night the fans stormed the field after the Brewers took a 3-games-to-2 lead – they had not even won the Series, and the Brewer faithful were delirious, as if victory was ours. As the decades pass, the aforementioned memories are part of why we love that team, how they came the closest of all Brewers teams to a World Series win. 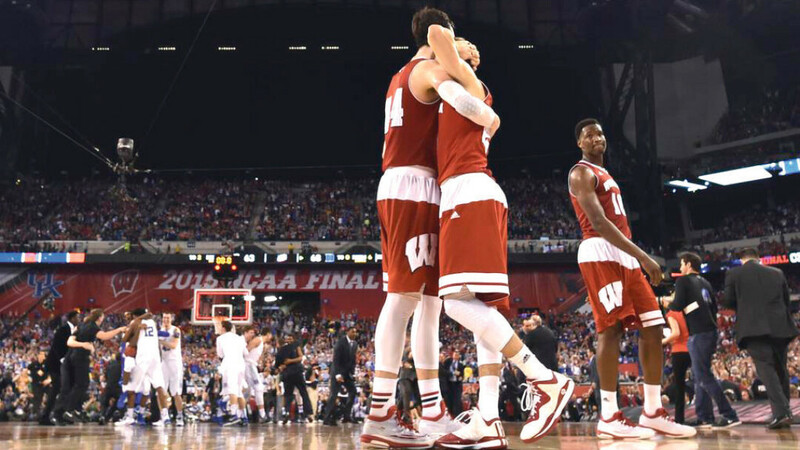 The Game 5 parallel to the 2015 Badgers tourney journey is the Kentucky upset in the Final Four. The take-down of a 38-0 team that featured one of the best shots at the first undefeated NCAA D-I season since 1976 may be considered the most-memorable Badger basketball game ever. Continue the parallels: The Brewers get close to the Series in ’81, and the Badgers get close to the title game in ’14; each team’s characters are endearing to fans – Robin, Molly, and Gorman, meet Frank the Tank, Dekker, and Nigel; both brought exceptional offensive firepower; a longtime coach in the sport – Harvey Kuenn, Bo Ryan – received national attention; the road unis were sartorially questionable, but throwbacks will be worn for decades. The day of the NCAA Championship, I may have unwittingly solidified the connection. In march, my radio co-host Dan Kasper caught me wearing a shirt colored light blue – Carolina blue, really – the day of the Wisconsin-North Carolina tournament match-up, and when I accidentally wore Arizona navy the following day – and the Badgers beat the Wildcats that weekend – I had to keep wearing opposing team colors. I was dressed in blue shirts the entire week leading up to the Kentucky tussle. Since I intended to wear a baseball jersey April 6 for Opening Day, and with the Badgers’ opponent being the Blue Devils, I figured could easily keep the streak alive with my powder blue ’82 Paul Molitor road jersey. Little did I realize that I unleashed a karmic bonding between legendary Wisconsin sports teams, one that would bring depression to millions of Wisconsinites that night, but perhaps a wistful nostalgia as the years pass. The sting will fade with the months and years. And, once again, a Wisconsin-based runner-up will be remembered as winners for eternity in the Badger state sports consciousness.